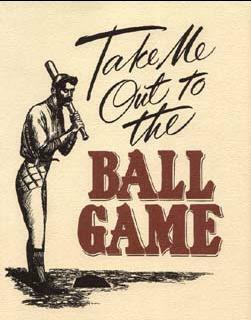 That’s Bob Dylan reciting, on the May 23rd edition of “Theme Time,” the all-but-forgotten first stanza of "Take Me Out to the Ball Game," the reworked 1927 version of Jack Norworth's song which has become the unofficial anthem of baseball. Norworth originally wrote the lyrics for "Take Me Out…" almost one hundred years ago, in 1908, and then published a revised version nineteen years later, changing the original lady fan's name from Katie Casey to Nellie Kellie and updating some of the references. Albert Von Tilzer, a friend of Norworth and composer of "Wait Til the Sun Shines, Nellie," wrote the melody for Norworth's lyrics. By 1910, the song was a fixture in baseball stadiums. "Take Me Out to the Ball Game" is the 3rd most-often-played song in the United States, after "The Star Spangled Banner" and "Happy Birthday to You." Jack Norworth wrote over 2,000 other songs in his career, including "Shine on Harvest Moon." And although he wrote baseball’s most popular song 32 years earlier, Norworth didn’t attend his first ballgame until 1940. He lived until 1959, spending his final years running a novelty shop in Hollywood and, on request, would perform "Take Me Out to the Ballgame." This has been Fred Bals with the Dreamtime podcast - occasional commentary on Bob Dylan's Theme Time Radio Hour weekly show. Dreamtime is not associated with XM Radio, Bob Dylan, or much of anything else. Until next time… dream well.